My plan to do a crafting post each month appears to have fallen slightly behind, with the last one being in September! I'll have another go this year, starting with yet another catch-up post. I picked out my first ever cross-stitch pattern at the Handmade Fair back in September. 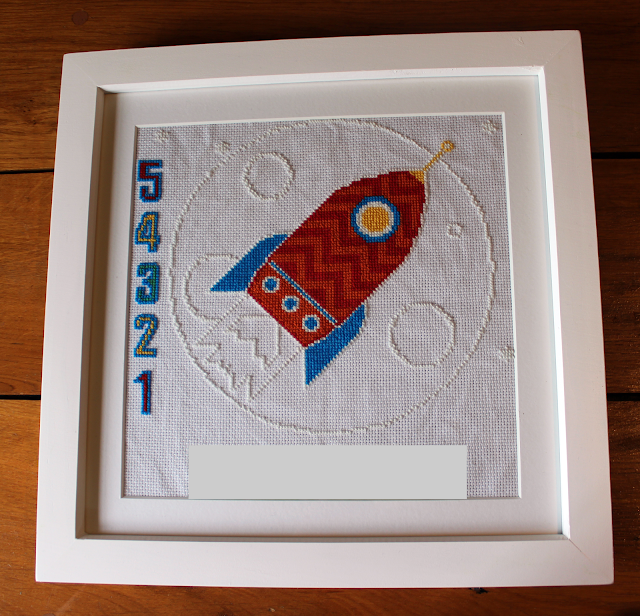 It's a cute glow-in-the-dark rocket for my baby's room from Bobo Stitch and I'm quite pleased that I managed to finish and frame it before he's old enough to leave home! Here's the finished product, with his name removed at the bottom to protect the innocent; conveniently this also hides a spacing error I made that still makes me want to unpick and redo the whole word! I'm told that doing this would be considered crazy, so it'll have to stay as it is! I love the glow-in-the-dark thread, the whole thing looks really great when the lights go out. I had big plans to make for lots of similar decorations, but only managed one in the end. Maybe more for next year! There's quite a lot still to go on this one, but hopefully I can get it done for *next* Christmas! Moving on from Christmas themed things, I finally put all the pieces together for the baby's mobile after months of looking at the pile of finished crochet bits. Ta daaah! It's a bit of a mash-up of three patterns and goes from space through to sky. Random, I know, but I think it turned out pretty nicely! I found a pattern for Amy Gaines' Happy Day Mobile on Ravelry for free and fell in love with it straight away, but at the same time I really wanted a space-y theme in there somewhere. I bought a pattern for the rockets, planets and moon from One & Two Company but didn't really like the stars it used, so I found a free pattern on the Mohu blog for some smaller ones. On the way I made a few modifications. The clouds in the Happy Day pattern were all flat circles, which I thought looked a bit odd against all the other puffy bits - so I gritted my teeth and made double the amount so I could stuff them like the other elements. I had to make a bit of a modification for (what seems to be) an error in the planet pattern, which was a bit disappointing in the only pattern I'd had to pay for! I finished off the planets and moon little kawaii faces to so that they matched with the sun, rainbow and raindrops. Oh and I also added rattles and chimes when I was stuffing the parts so that when the mobile turns it makes a nice noise! So that's pretty much it for what I've been making since my last post! I've now starting working on the Frosted Pumpkin stitch-along for 2016 - the Pumpkin Passport, a travel themed pattern where you get a new section each month with a different international city, but more on that later!